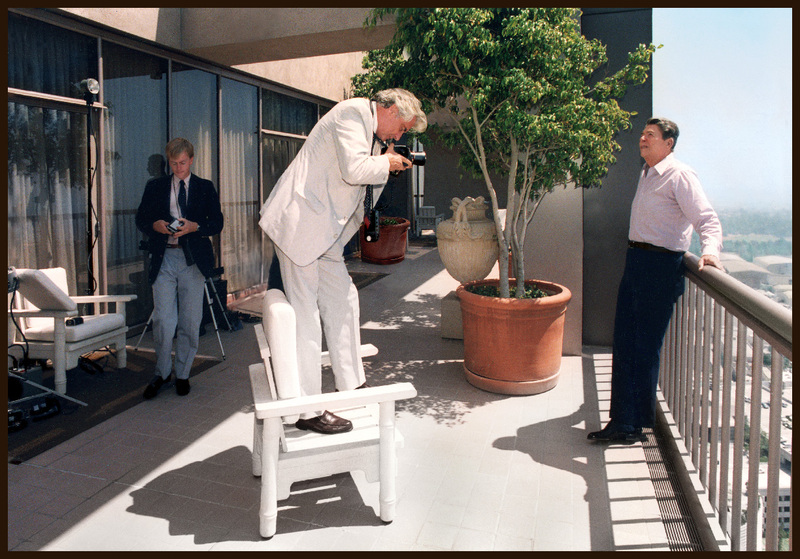 President Reagan was not only the first guest to enter the newly completed Century Plaza Tower in 1984, but he stayed in this magnificent 360-degree view suite encompassing the entire 32nd floor of the Tower with such frequency that it was dubbed the "Western White House" by the media. In 1999, the Suite was remodeled and christened the "Ronald Reagan Suite", an opening attended by Nancy Reagan and extensive media coverage. We had the honor of developing the strategy for this project for the hotel, St. Regis at the time, and producing the exhibits chronicling the President life and relate publications. Our most popular image - there is something astonishing about this view. 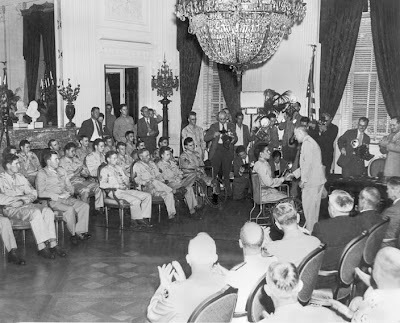 I once met a man at my gallery who said he was with the security detail and was in the room at the time that this meeting occurred - remember it as with a chill of destiny brewing as he recalled President Reagan telling the Pope that it was their destiny to stop the "Evil Empire" of the Soviet Union. This became a mutual crusade aligned these two leaders with this objective, establishing through "holy alliance". Pope John Paul hated communism intractably, leading to their first meeting June 7, 1982, in the Vatican Library. 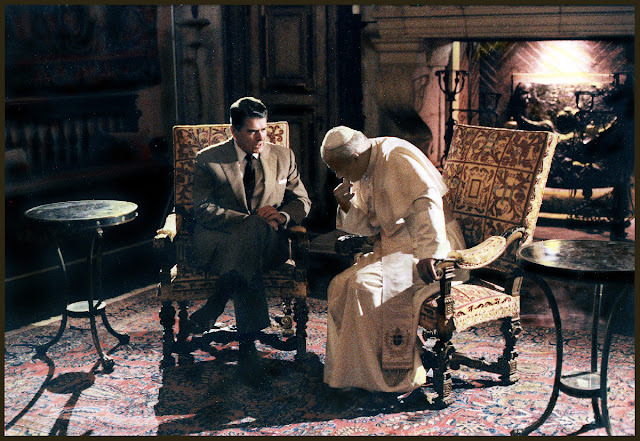 "One of his earliest goals as President, Reagan says, was to recognize the Vatican as a state 'and make them an ally'"
"Both the Pope and the President were convinced that Poland could be broken out of the Soviet orbit if the Vatican and the U.S. committed their resources to destabilizing the Polish government and keeping the outlawed Solidarity movement alive after the declaration of martial law in 1981." "A free non-communist Poland, they were convinced, would be a dagger to the heart of the Soviet empire; and if Poland became democratic, other East European states would follow." " The objective was akin to creating a Christian Democratic majority in Poland with the church and the overwhelmingly Catholic membership of Solidarity as the dominant political force in a post-communist Poland." "Both sides agreed that the Soviets must become the focus of an international campaign of [Economic] isolation and the withholding of Western and Japanese technology from Moscow." "The key Administration players were all devout Roman Catholics—CIA Chief William Casey, Allen, Haig, [Vernon] Walters, William Wilson, Reagan's first ambassador to the Vatican. They regarded the US-Vatican relationship as a holy alliance: the Moral force of the Pope and the teaching of their church combined with their fierce anti-communism"
Archbishop Pio Lashi said: "It was a very complex situation But I told Vernon, 'Listen to the Holy Father [Pope]. We have 2,000 years' experience at this.'" "Step by reluctant step, the Soviets and the Communist government of Poland bowed to the moral, economic and political pressure imposed by the Pope and the President." Based on Business Image Group’s recommendations, the Century Plaza Hotel, redesigned its Tower penthouse suite to commemorate its long-standing relationship with former President Ronald. 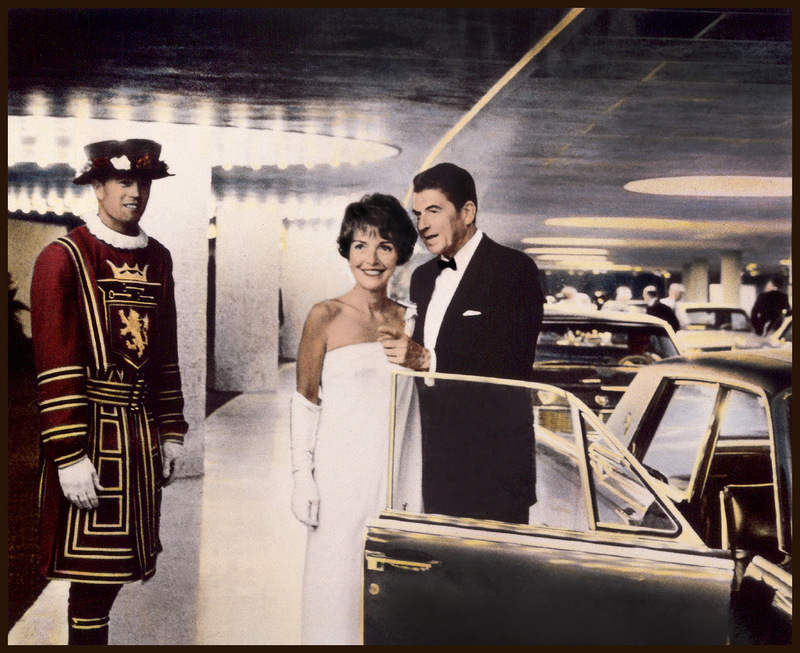 The project featured vintage photographs showcasing the "Reagan Legacy" reproduced in museum quality exhibits. Support services included consultations on interior styling, speciality artwork, brochures, and digital media management to facility public relations activities. Ronald Reagan as George Gipp ("The Gipper") from the Warner Bros. film, "Knute Rockne, All American" 1940. Reagan played this role ( George "The Gipper" Gipp) in the film Knute Rockne, All American; this led to his lifelong nickname "the Gipper".